1. Pull up bar – I love pull ups. And while I almost considered excluding this and instead including foam rollers, I felt that the pull up bar was just too essential (and it is too easy to foam roll with a ball you just have lying around the house). Even if you can’t do pull ups YET, a pull up bar can be used to do all the isometric holds to work up to being able to do a full pull up. You can also do scapular retractions on the bar as well as ab exercises. While the least necessary piece for beginners on the list, it is really probably the best piece for core and back work. 2. Jungle Gym straps – Best way to work your ENTIRE BODY. Honestly as long as you have a door or another place to hang them, this is the single best piece of equipment to have for your home. They are just like the TRX straps but a bit cheaper and in my opinion just as good if not better. You can literally work every muscle using these straps. And these straps can be used to make moves easy enough for the beginner or difficult enough for even the advanced lifter. Balance lunges with your foot up in the strap or single leg squats with only one of the straps for assistance can be extremely difficult! So don’t think that you need a ton of weights to get in a gnarly workout at home. There are always ways to progress moves for any body part on the Jungle Gym straps! 3. Sandbag – Since I love lifting heavy, I did want to include some sort of weight equipment on this list….and sandbags won out. They can be used to work any part of the body and the weight can be easily adjusted by pulling out some of the filler bags or not filling the bags completely full. They are also an extremely functional weight since they are awkward. They also really don’t take up that much room and you won’t really have to buy more pairs, like you would dumbbells, as you progress. Not as necessary for the beginner, but a great way to start lifting some weight. 4. Sliders – Sliders can be used to progress exercises for any part of the body and can be a good substitute for weighted activities. They make exercises more difficult because they create a more unstable environment. For example, there is no traction when you slide out to do a side lunge and then try to drag the slider back in toward the standing leg (I always tell people NOT to go out as far as they think they can the first time because they won’t make it back in). Sliders are also fairly cheap and a small piece of equipment that you can basically store anywhere. They are a great way to progress moves without needing weights. And shoot, if you have hardwood floors you can even make your own sliders out of socks! 5. Resistance bands – While I was at first hesitant to put these on the list because you can basically strengthen the exact same body parts with the Jungle Gym straps, they did end up making the list because they are probably the easiest and best piece of equipment to carry with you if you travel a lot. Also, I had considered putting on mini bands for glute activation exercises (since glute activation exercises are extremely important yet everyone skips them) BUT you can make modifications so that you can sub resistance bands for mini bands! Anyway, the point is resistance bands are super versatile, easy to store and can be used by everyone from the beginner to the advanced lifter. Also, unlike dumbbell lifts, moves done with resistance bands have a lot more tension and resistance throughout the full range of motion of the lift, which is an added bonus. 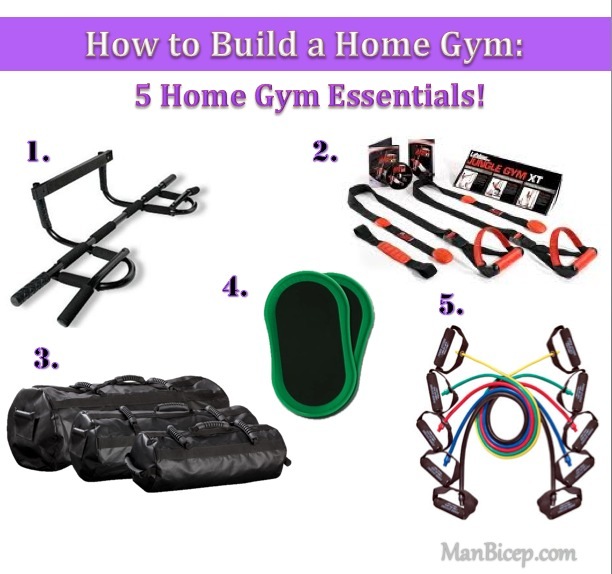 So now you know the only five pieces you really need for a COMPLETE home gym. BUT what if you can’t get all five? If you can only get two items from this list, I would suggest getting only the Jungle Gym Straps (or resistance bands) AND a sandbag. HOWEVER, if you want to spend less, resistance bands and sliders can be a great way to increase the intensity and add variety to any of the bodyweight or home workouts you may be doing. As I mentioned before, foam rollers almost made the list. And it was a very hard decision NOT to put them on there. They honestly didn’t make it because a tennis ball or rolling-pin will work 95% of the time and most clients I’ve encountered have one or the other (or would rather spend the few dollars on one of those instead of shelling out $50 to $100 bucks for a true trigger point tool). However, if money isn’t an issue and you have space for a bit more equipment and are serious about getting great results, I would suggest investing in some trigger point tools to target exactly your problem areas! What are your favorite pieces of home equipment? 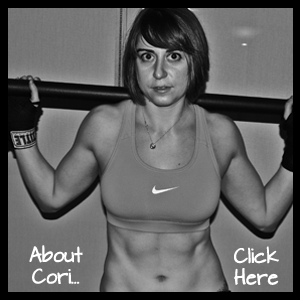 Need some help creating your home gym and designing workouts? Let me know! NOTE: In posts to come, look for exercises using each of these pieces.